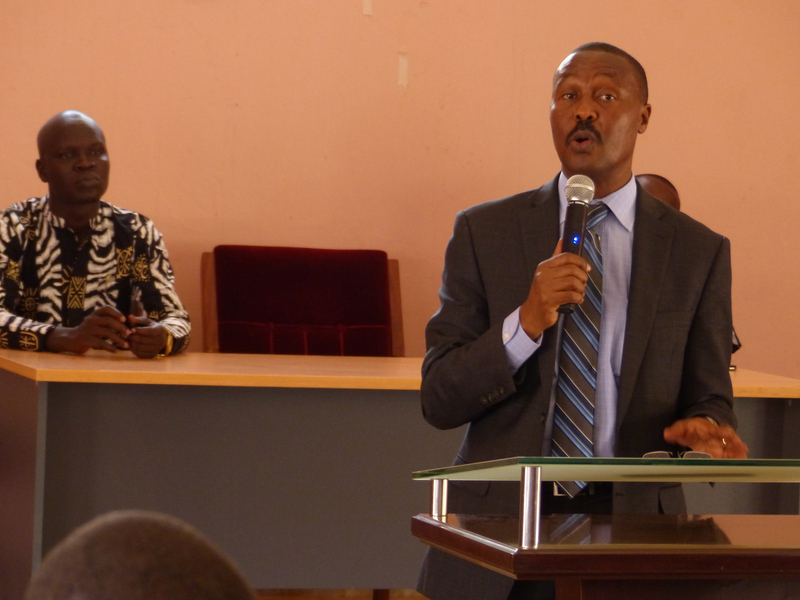 KAMPALA – Former Forum for Democratic Change (FDC) president Maj Gen (Rtd) Mugisha Muntu has finally confirmed his departure from the opposition political party. In his four-page statement released on Tuesday evening, Gen Muntu said he resolved to leave the party after making countrywide consultations from which he discovered that there irreconcilable differences with the current party leadership under Mr Patrick Amuriat. He adds that most of many of the party members are frustrated, by the way, things are being run by the current party leadership or with the way things were being run under mine. “Once again, the purpose of pointing this out is not to criticize or undermine the current leadership, but to simply state things as we see them. There are two possible outcomes of our conclusion on this matter; either we are wrong in our assessment or we are right. If we are wrong, then the party need not worry about it because our efforts will quite simply fall flat sooner than later and it will prove to us all that our ideology is flawed. In the event that we are right however, and our perspective resonates with a huge number of Ugandans, it is in FDC’s interest that those who fill this political void are friends of the party and are able to work with it on the shared goals and interests. Whichever way our reading of the situation goes therefore, it is our belief that it is in the best interests of the FDC for it to be explored,” he added. I write to you today, in order to give you a detailed report of what a number of us have been doing since the beginning of the year. It is my hope that this report shall enable you to understand fully, our actions, intentions and hope for the future. During the party presidential elections held last year, it was clear that there were two emerging views about the future of the party: the first was that of defiance. Those that held this view felt that the best way forward was to engage in sustained civil disobedience and other such activities with the end goal of ‘reclaiming our victory’ from Gen. Museveni, consolidating the ‘People’s government’ as constituted by some party leaders and like-minded opposition members and ousting the regime by popular protests. The focus here was perhaps best captured by our now party president Patrick Oboi Amuriat when he declared, ‘Under my leadership, there will only be one party strategy: defiance’. The second view, which I championed, was that without properly constituted party structures, we could not achieve much. We believed that our focus should be on building grassroots structures such that whether we chose to engage in civil disobedience or participated in electoral processes, we would have the capacity to not only mobilise people to vote nationwide but also field strong candidates right from LC1 level and be able to protect our votes. In the event that we were to engage in civil disobedience, our view was that we should have party structures in place to not only hold these activities across the entire country but also sustain them over a long period of time. A few protests in Kampala and other strongholds might make it to the evening news, but they will not deliver the change we need. When the party delegates gathered to vote, the majority chose the defiance agenda. I have said before and will restate today that the elections were legitimate and my brother Amuriat was the rightful winner of this contest. I have never and will never attempt to discredit his victory or contest it in any way, shape or form. However, the implication of this victory, was that those of us who feel very strongly that the party should be focused on a different path were faced with two choices: we could either engage in disruptive politicking within the party, with the view of compromising the new leadership’s agenda or we could engage in constructive consultations with them with the view of finding out if there is space for us to not just exist within the party, but also continue to do the things we believe should be done (without appearing to counter the leadership). Those of you who have interacted with me know that I am uncompromising when it comes to ethical practice; I do not believe in doing things behind people’s backs and if the choice before me is to do so for political gain or avoid it and risk political loss, I will always choose the latter. Therefore, after conceding defeat and officially handing over the party, I also publicly announced that we would engage in nationwide consultations to determine our next steps. We promised that we would be transparent about our activities and intentions at every step of the way. I am therefore glad to report to you that there is no single consultative meeting we have held without the involvement or informing of local party leaders. Each of these meetings has also been open in nature, with people from all sides of the political spectrum in attendance. As mentioned earlier, our view has always been that we cannot hope to achieve our objectives without strong grassroots structures and networks. This view is not just a theoretical ideal. You all know that after the 2016 presidential elections, we had decided to contest the outcome as declared by the Electoral Commission. When we set about gathering our evidence, however, we found ourselves in a situation where we could not collect or locate over 9000 DR forms. In our view, the logical thing to have done after we had been cheated in the 2016 general elections would have been to do an assessment of our situation and plug our weak points. Instead, we slid back into our internal fights as had been happening in the last five years. During the party presidential campaigns, it became very clear that there was even less tolerance for alternative views. Not towing the ‘correct line’ meant being branded a mole. After the elections, many of us sincerely wondered whether there was still a place in the party for our views or if we were simply expected to keep quiet and follow whatever others believe. This is not a sustainable way to live or lead. We also could not in good conscience, engage in sabotaging the new leadership or compromising their efforts. As someone who lived through that kind of situation first hand during my 5-year tenure as president, I can authoritatively say it is of no use to anyone. It neither advances the party nor benefits any of the warring groups. All it does is distract the entire opposition, spend all our energy on internal power struggles and benefits those in government. And so, the only way forward was for us to engage in an open, mature, systematic and inclusive nationwide dialogue about whether to stay in the party or not. It is no secret that there have been calls from the population for new political actors. In the aftermath of our party presidential elections, there was the talk of formation of a ‘Third Force’. There was also anecdotal evidence of a need for this; the number of independent MPs and leaders has been steadily growing, several people even within the ruling party have been dissatisfied with their party but not convinced enough to join ours and there is a huge number of youths, especially among the working class, that is critical of government but sceptical of the opposition as well. These are facts that every political actor must seek to understand. 1. Is the political space in Uganda ripe for a different approach to politics? If consultations were held and the conclusion was that it isn’t, well and good. If not, however, we’d then need to proceed to the next question. 2. What are the changes that need to be made to meet this political vacuum and are we as a party willing to make those changes? Sometimes, you find that while there are calls for a certain change, the party is either unable or unwilling to make those changes. If for instance there is a sizeable number of people calling for armed conflict, it might be a real desire, but one that we as a party are unwilling or unable to heed due to our principles, values or status. If on the other hand, the changes to be made are reasonable and within our reach, then we would set about engaging in them in order to fill this vacuum. Our consultations, therefore, have been an attempt to answer these questions. Of course, given that we are not the ones in leadership, our hope was (and continues to be) that the FDC leadership appreciates that we set out to seek answers to questions that concern us all. Our reading of the situation was that for all intents and purposes, there were two parties existing in one. And until this was resolved, the party would end up suffering from infighting. 1. There is a nationwide recognition of the fact that FDC is fractured. During all our consultation meetings, everyone that spoke admitted to or spoke of an internal rift in ideology. Many of our people are frustrated, either with the way things are being run by the current leadership or with the way things were being run undermine. The purpose of pointing this out is not to apportion blame, but to simply articulate what most, if not all of us know for a fact. 2. There is a strong desire among many party members for the reconciliation of the two major outlooks within the party. However, in spite of the good intentions, it has been our experience that simply reconciling for the sake of reconciliation is neither sustainable nor even ideal. During my term in office, for instance, the amount of resources and time we spent on trying to keep the party united far outweighed the effort that was spent on building the party and furthering our agenda. Therefore, while I had the honour of handing over an unfractured party with more financial resources and stability than I inherited, it is also a fact that we had not made as much progress as we could have had we not had internal intrigue to deal with. It is, therefore, our view, that under the current circumstances, attempts at reconciliation will only be cosmetic, hinder the growth of the party and quite simply leave most members feeling dissatisfied at best and antagonistic towards each other at worst. 3. Our reading of the current political situation in the country is that there is a political void that is not being filled by the party’s current strategy. We believe that this vacuum needs to be filled as soon as possible by approaching our leadership problem from a different perspective. Once again, the purpose of pointing this out is not to criticize or undermine the current leadership but to simply state things as we see them. There are two possible outcomes of our conclusion on this matter; either we are wrong in our assessment or we are right. If we are wrong, then the party need not worry about it because our efforts will quite simply fall flat sooner than later and it will prove to us all that our ideology is flawed. In the event that we are right, however, and our perspective resonates with a huge number of Ugandans, it is in FDC’s interest that those who fill this political void are friends of the party and are able to work with it on the shared goals and interests. Whichever way our reading of the situation goes, therefore, it is our belief that it is in the best interests of the FDC for it to be explored. 1. We have resolved to leave the party. As already explained, we do not do so in anger or animosity towards the current leadership, but in careful consideration of the national cause of liberating our country. The current party leadership needs to be given the opportunity to pursue their agenda untethered by the constant worry of sabotage or suspicion. 2. To the extent that it depends on us, we are committed to ensuring that our departure causes the least possible disruption to the party and is amicable. We recognise that even though our preferred modes of operation differ significantly, our general goals and objectives for the country are aligned. As has been our policy throughout the consultation process, we commit to discussing issues, not people and to continue to put the country’s interests before selfish or partisan ones. In the same spirit, we call upon the FDC leadership to receive our departure in good faith, not as an indication of defiance to them, but a reflection of our confidence in the possibilities of unfettered cooperation. 3. We recognise that there are leaders elected on the party ticket that are aligned to our view of things. While we encourage them to be true to what they believe, the decision of whether to resign their positions and join us, remain in their positions and cooperate with us or any other such action is entirely theirs to make. We neither seek to hold anyone at ransom nor cause any institutional disruption. Likewise, those party leaders opposed to our departure can rest assured that we respect their position and will not attempt to antagonise them. We encourage everyone to make a personal choice and commit to it without unnecessarily maligning others’ choices. 4. Given the legal, logistical and practical challenges that will inevitably come from our decision, we are willing and offer to have a small committee composed of members from either side to discuss and agree on the best way to handle our departure. However, should this be deemed inconvenient or disruptive by the party, we would not like to place any extra burden on it. Our only hope is that an atmosphere is created that enables people to choose the direction they want to take without feeling unduly constrained. In conclusion, we believe that for the country to move forward, it needs strong parties and institutions. For a long time now, there has been a culture of individualism and we are conscious of the fact that attempts to build structures that are stronger than individuals will be an uphill task. Nevertheless, we persist, fully convinced that the destiny of our country rests not on the strength of a benevolent dictator or patriotic individual, but on the structured effort of every citizen. The sum total of our collective effort is far greater than our individual capacities. And so our commitment to you is that when we are finally established elsewhere and need to work with you to achieve common goals, our doors and hearts will always be open with the friendship and bond of beloved kin. For we are not enemies but allies.